We are incredibly proud of our Dog Dynamix students who have shown in multiple competitive dog sport venues. Check out what some of our talented clients have done with their dogs! Hunter is a 4 year old Husky mix, owned by Shannon. Hunter has 29 titles: AKC Trick Dog: TKN, TKI, TKA and TKP AKC Rally: RN AKC Agility: ACT1 AKC Canine Good Citizen: CGC and CGCA AKC Barn Hunt: RATI, RATN, RATO, RATS and CZ8B UKC Rally: URO1 UKC Agility: UAG1 ASCA Obedience: BN ASCA Rally: RN Iron Dog: IRDRWP1 and IDRWP2 Internation Weight Pull Association: WD and WDE American Pulling Alliance: R1B, R2I, R3A and STAR1 World Wide Weight Pull Organization: WDA, WPDW, WPDR and WPDXR 2014 IWPA World Championships 2017 Iron Dog National Championships: 2nd place Wheels and 3rd place Rails. Hunter is also a fashion model for print and television ads. Darby is a mixed breed dog owned by Mackenzie, who is actively competing in AKC Obedience and has qualified in all 8 shows she has entered. She took first place five times, second place twice, and third place once! She is also currently training in Rally Obedience and Agility with us, and loving every minute of it!! 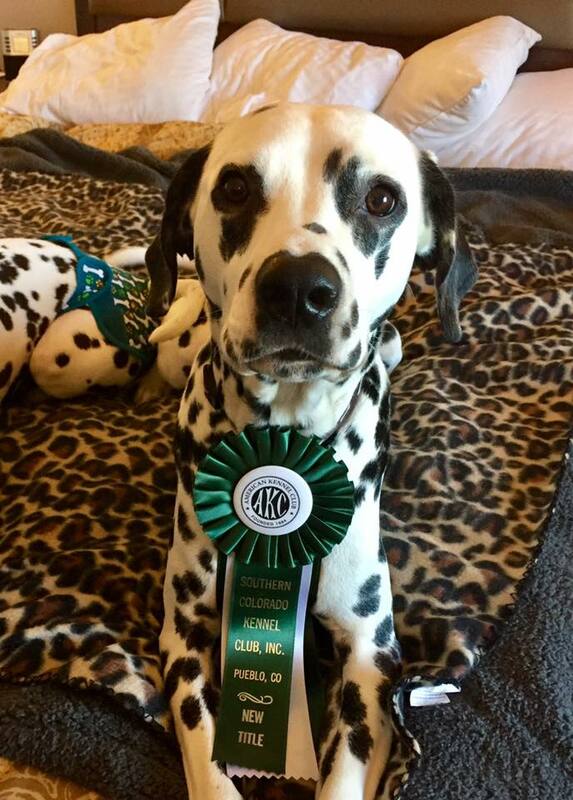 Blue the Dalmatian earned his Rally Novice title recently with his owner, Carol. He has been training in Rally Obedience for under a year, and has blossomed into a happy, enthusiastic worker. Blue and Carol hope to go for their Rally Advanced title, and may start agility soon! The Dutch Army is the collective name of Heather's rescued Dutch Shepherds. Kapua has earned a leg of her MR1 in Mondioring, and her ASCA Rally Novice title. Kū has earned his Mondioring Brevet. Kam also trains in Mondioring, although he has not trialed at this point. Kanaloa and Kāne both train in agility with us at Dog Dynamix, and we hope to see them trial in the future! They have additionally earned their Canine Good Citizen and Trick Dog titles! Heather and Kapua earned the Mondioring One Title with a score of 190 out of 200, and first place. Congratulations Heather and Kapua! Shaka is a Rhodesian Ridgeback owned by Nicole. When Shaka first began training with us, he was timid and shy. Seeing him now, you wouldn't believe it! Shaka received his UKC Rally Novice title in a single weekend this winter, placing each time with great scores! Jeremy and Zelda are an incredible team to watch. Zelda is a master of shaping and currently trains in Mondioring, Rally Obedience, and, most recently, agility. Zelda has her AKC Canine Good Citizen title, Novice and Intermediate Trick Dog titles, and has achieved her AKC Rally Novice title.